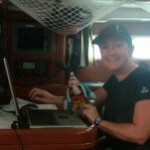 My Virtual Assistant and UKAVA founder Justine Curtis was recently given the opportunity to realise a life’s ambition to take part in the ARC yacht race across the Atlantic. 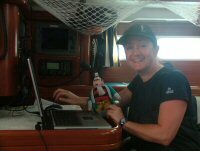 As a marketing and PR expert, Justine was invited along to keep the world informed of the boats exploits by way of a blog and to liaise with the press both at the start of the race in Gran Canaria and at the end in St Lucia on behalf of green energy company Voller. Justine is the Director and Business Development Manager of My Virtual Assistant (www.my-va.com) a company offering PA and business support services to entrepreneurs and small businesses throughout the UK. She is also joint founder of the VA SUccess Group virtual assistant training company (www.vasuccessgroup.co.uk) and the founder of the UK Association of Virtual Assistants, (www.ukava.co.uk) an organisation set up to raise awareness of the role of virtual assistants (VA’s) and provide information and advice for both VA’s and their clients. Voller Energy, a company that develops portable fuel cells, offered Justine the exciting opportunity to take part in the 2007 ARC Race. A fuel cell had been installed on their yacht ‘Emerald’ for testing purposes and Justine’s role was to feed back throughout the race on the fuel cells performance and general conditions of life at sea under blue water racing conditions. Whilst this was a great opportunity, it would also mean 4 weeks away from her desk and Justine was keen not to let her existing My Virtual Assistant clients down or leave her business unattended. Although there was a satellite phone on the boat and therefore an Internet connection, all be it a very slow and expensive one, what she actually did is what every virtual assistant advocates, she handed over all the work that she could to another virtual assistant. The race was an eventful one with very rough weather conditions, many boats being damaged and several abandoned but Vollers ‘Emerald’ made it to St Lucia relatively unscathed and the fuel cell performed brilliantly. The crew had an exciting crossing learning to catch fish, cook, eat and sleep on a boat that’s constantly lurching from 45 degrees one way to 45 degrees the other and enduring a series of shocks at 7Gs. They were delighted to finally arrive all in one piece to an eagerly anticipated rum punch and just in time for Christmas. Resources: Justine Curtis is the founder of My Virtual Assistant, a virtual office service operating across the UK, providing virtual office support, personal assistance, secretarial services, administration and business support services remotely from its UK based office.